Why and how to cleanse crystals you use for healing while at the beach or lake this summer is the subject of this short series this week. 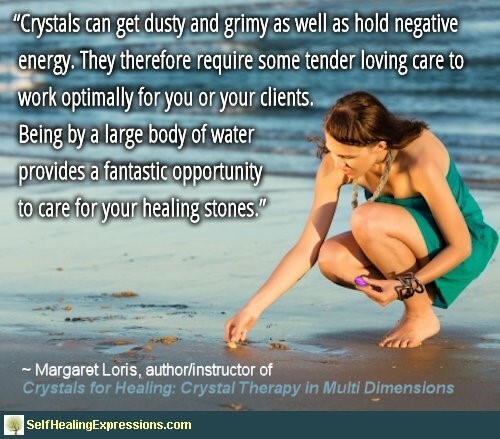 Crystal therapist, author and instructor of Crystals for Healing: Crystal Therapy in Multi Dimensions, Margaret Loris, will discuss why and how to clean, clear and charge your crystals while by large bodies of water. We hope you enjoy! How to cleanse crystals with sea water. Are you planning a summer vacation by the beach? Going fishing at your favorite lake? How about swinging on a rope across a river? Being by a large body of water provides a fantastic opportunity to care for your healing stones. What’s the importance of knowing how to cleanse (a.k.a. clear) your crystals? Your crystals are energetic extensions of you and your energy. They need to be attuned to your vibrations in order to be effective assistants in healing. Crystals can get dusty and grimy as well as hold negative energy. They therefore require some tender loving care to work optimally for you or your clients. When and How to Cleanse Crystals? When you first get a crystal and immediately after you use or wear one, you will want to clean it of dust or oils as well as cleanse it of any negative energy. This is something that can be easily accomplished at a beach, river or lake. So how do you cleanse crystals? Here’s one way: Hold your stone in your cupped hands as you bend down and allow the powerful sea water, lake or river waters to quickly remove any debris – as well as negative or unwanted energies. Make certain your hands are cupped to prevent the water from pulling the crystals right out of your hands! If that happens, quickly retrieve them or they may get pulled out to sea. This crystal cleansing process is almost immediate. You’ll be able to sense how crystal clean your stones have become. So remember to pack your crystals to accompany you on your vacation or day trips to the water this summer! Note: Certain stones should not be submerged in water or sea water such as opal, calcite, labradorite, lepidolite, moldavite, turquoise, pearl or alabaster. Remember, salt is crystalline too just like your healing stones so sea water could damage certain stones. © by Margaret Loris, author and instructor of the popular Self Healing Expressions course, Crystals for Healing: Crystal Therapy in Multi Dimensions. Wishes for Crystal Clear Clarity! Free eBook Shows You How to Reduce Depression and Anxiety with Crystals! This entry was posted in Crystals for Healing and tagged crystals for healing by June Cook. Bookmark the permalink.